Many of the following exhibition catalogues and essays were originally published in print and are available to view in their original format in full by clicking the button "Read More". "Over the course of Ming Fay's long and impressive artistic career, the primary inspiration for his work has been the relationship between mankind and nature. 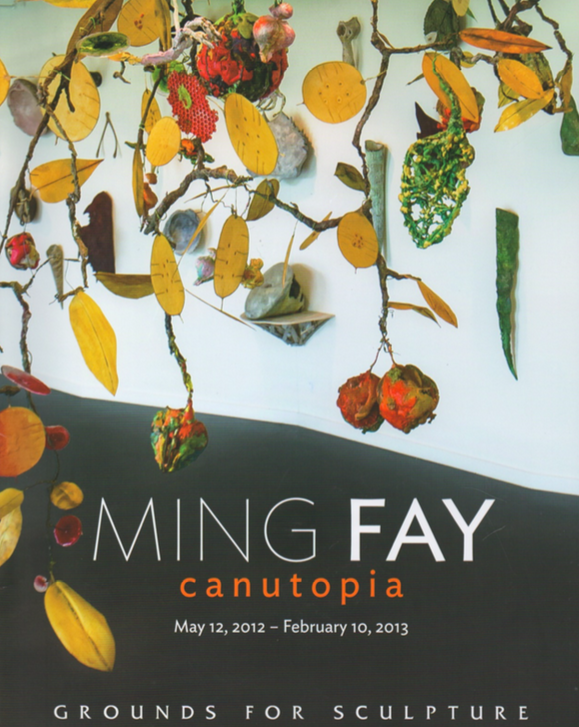 Canutopia - a retrospective of sorts - is composed of sculptures Fay has created during the past 30 years. The personal and artistic path he forged that has led him to create this major installation is a clear testament to the deeply held values that connect all of Fay's work. Complex both metaphorically and visually, Canutopia is a feast for the eyes, mind, and the spirit . . ."
"I do not remember the last time I met Ming Fay, but I am sure it was in New York, probably in the 1980s. Looking back, it felt as if it were in a past life. At the time, Ming Fay was making giant larger-than-life fruits, hundreds of times their real sizes. What impressed me the most was their striking resemblance to the real ones. Ever since then, Ming Fay has stayed as a perfectionist in my memory . . ."
"I first saw Ming Fay's installations with imaginary plants on a New Year card sent out by Alice King gallery several years ago; ever since, the image of his Hidden Seed Garden represented on this card lingered in my mind. In December 2006, I found the occasion to work together with Ming Fay on a project for the 5th International Ink Painting Biennial of Shenzhen . . ."
"After knowing Ming Fay for two decades, I am still amazed and more than amused when I enter his house on Broadway and am struck by a cornucopia of images: hanging sculptures, wild cherries, vegetables on command, fruit out of control, and a wealthy, truly a wealth, of gardens. After all the years I have seen his students imitating his voice, his voice is soft and clear. His work begins with a reference to the real, and somehow he has become the master of a scientific surrealism . . ."
"Composed of a dense growth of flora in searing tones of fuchsia, orange, and green, Ming Fay's installation, "Ramapo Garden of Desire" transforms the pristine white cube of the Kresge Gallery into a wild corner of nature. Fay's earlier gardens have simulated an archaeological past or envisioned a science-fiction future . . ."
"How many "realist" artists there are. But how few pose the question of "realism." The sculptures Ming Fay makes are intimately detailed yet forcefully integral presences. Among the things they are not concerned with: nostalgia, allegory, trompe-l'oeil, funk, narrative. Their subjects are ordinary things . . . "
"Ming Fay's early work was minimalist sculpture - cooly geometrical forms executed in industrial materials. What leap of imagination led him from the Platonic regularity of teh sphere to the variegated imperfection of the pear, from machine-tooled metal to a medium so preeminently hands-on as papier mache? The jump is not so long as it may appear. Ming Fay has not so much lost interested in what were known in the sixties as "primary structures" . . ."
Duvergne, Tania. "Ming Fay-- From Concept to Reality: Mosaics for the Delancy St / Essex St Subway Station." Artists Alliance, 2004. Web. 25 January 2012. Chang, Alexandra. "Epoxy Art Group." Grove Encyclopedia of American Art 1. Ed. Joan Marter. New York NY: Oxford University Press, 2011: 165-166. Print. Heartney, Elanor. Art in Architecture: Selected Works. Washington DC: US General Services Administration, 2008. Machida, Margo. "Migration, Mixing, and Place." Unsettled Visions: Contemporary Asian American Artists and the Social Imagery, Duke University Press, 2008: 194-269. Print. Hallmark, Kara Kelley. "Ming Fay." Encyclopedia of Asian American Artists. Greenwood Publishing Group, 2007: 51-53. Print. Machida, Margo. "Cultural Conceptualism and the Art of Ming Fay." Transcultural New Jersey: Diverse Artists Shaping Culture and Communities, 2. Office for Intercultural Initiatives and Zimmerli Art Museum, Rutgers, The State University of New Jersey, 2005. Print. Martin, Barbara E. "Ming Fay: Nature, Symbol, and Myth Inspire Public Art." WP Magazine 6.1, Spring 2004: 12-15. Print. Goodman, Jonathan. "A Decorative Reading of Nature: Ming Fay." Sculpture 22-7, September 2003: 46-51. Print. Ault, Julie. Alternative Art New York, 1965-1985. University of Minnesota Press / The Drawing Center, New York, NY, 2003: 31, 44, 65. Print. Barrie, Brooke. Contemporary Outdoor Sculpture. Gloucester MA: Rockport Publishers, 1999: 46-49. Print. Lippard, Lucy R. Mixed Blessings: New Art in a Multicultural America.Pantheon Books 1990. Print.